Action Lab: Danger Zone’s SPENCER & LOCKE was one of the unquestioned gems of 2017, with writer David Pepose and artist Jorge Santiago Jr. blending two unique styles of storytelling into an utterly compelling series. The critical response was overwhelmingly positive, so much so that the series was actually picked up for a feature film adaptation, and while we eagerly waited for future announcements regarding that development, we figured we were pretty much done with the comic book version. 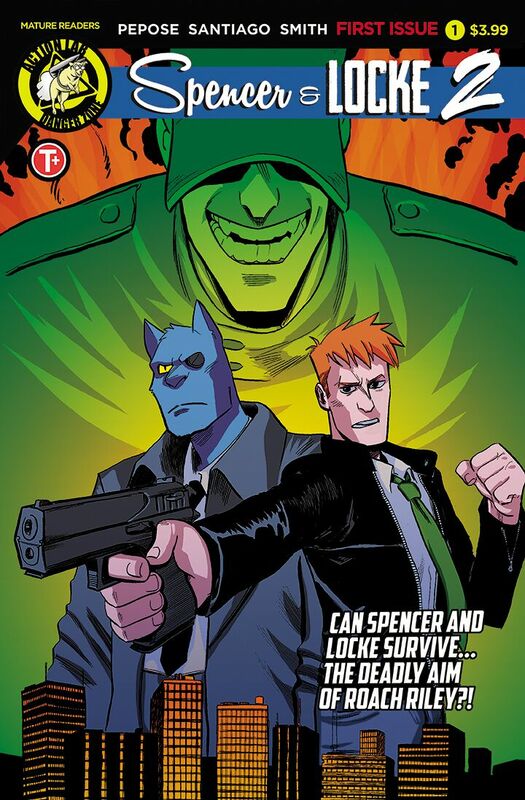 Well imagine our excitement when we discovered that SPENCER & LOCKE was set to return for a brand new series this April, seeing our deeply traumatised detective and his imaginary friend being forced back into action against a terrifying new adversary. We simply had to know more, and thankfully both David and Jorge were able to take some time out of their busy schedules to sit down and chat about the success of the first series and what we should be expecting from the second. BCP: Firstly, before we dig into the sequel, and for the benefit of any of our readers who may have inexplicably missed it the first time around, can you give us a quick rundown about what SPENCER & LOCKE is all about? 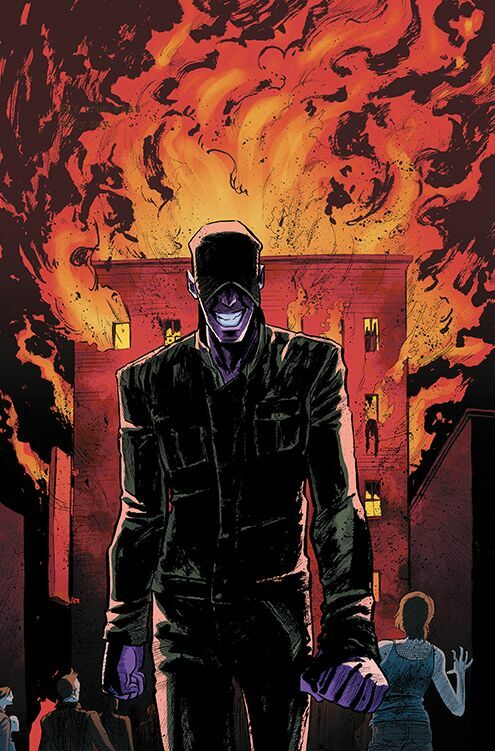 DAVID PEPOSE (DP): The easy elevator pitch for SPENCER & LOCKE is “what if Calvin and Hobbes grew up in Sin City?” Our first series followed hard-boiled Detective Locke as he returned to his old neighborhood to investigate a brutal murder alongside his trusty partner, his imaginary talking panther Spencer. 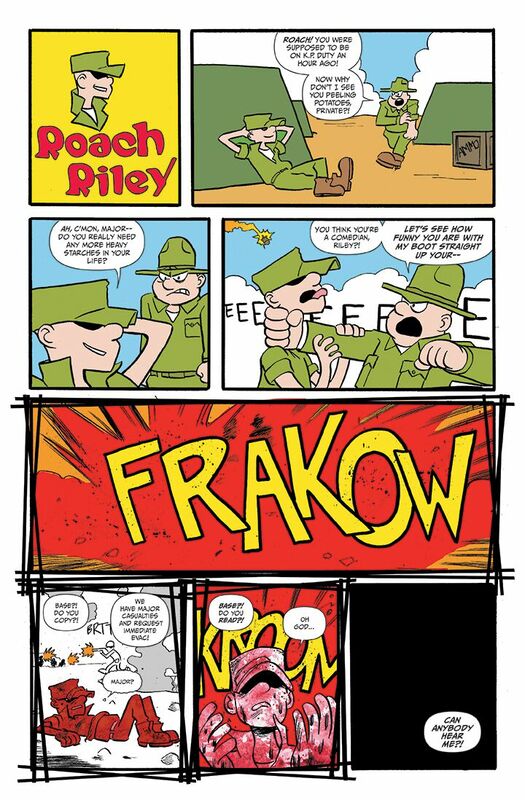 But of course, as readers will learn in SPENCER & LOCKE 2, parodying Bill Watterson was just the tip of the iceberg, as our sequel will go Fables-style across the funny pages, pitting our unlikely heroes against Roach Riley, a murderous former soldier who happens to be our take on Mort Walker’s classic strip Beetle Bailey. BCP: Now obviously as creators you always believe in what you’re doing, but did either of you expect the absolute onslaught of critical acclaim the first series received? DP: Honestly, it was tremendously heartening to get the response that we did, since, y’know, I had been half-expecting to be thrown in comic book jail! (Laughs) I knew walking in that our high concept was a high-wire act. When you take a cow as rightfully sacred as Bill Watterson’s Calvin and Hobbes and make hamburger out of it – and then start stacking in themes of child abuse and mental illness – the stakes feel a lot higher. No matter whether it was a success or a failure, SPENCER & LOCKE was going to be loud about it. Thankfully, though, that critical ratio really went in our favor – almost everyone who read SPENCER & LOCKE got what we were doing, and understood that we had a deeper story to tell beyond just an edgy parody of a well-known children’s property. I’ve had people from actual abusive upbringings come up to me at cons and tell me how much the book meant to them. Honestly, that’s the best praise I could ever hope to get as a creator – it makes what we’ve done feel a little more real, and have a little more impact, you know? JORGE SANTIAGO, JR. (JSJ): I’m really happy that people really seemed to enjoy SPENCER & LOCKE, but honestly I had no idea how well it would be received, or that we would be nominated for awards for it. I thought this comic would have a rough time, but I’m happy to say that it’s hit a lot of people’s hearts, which is the best response we could ask for. BCP: The insane buzz about the first series actually led to you being picked up for a feature film. Has there been any movement on that front in recent months? DP: While I can’t say too much publicly, we’ve had some very cool conversations on the SPENCER & LOCKE movie front with some very talented people! We’re hoping to have some news we can share soon, but I think 2019 is going to be a good year for our boys. JSJ: I just hope if they do make it into a movie that they let us have a cameo, maybe we can be henchpeople or something like that. BCP: So a lot went down in the first arc. Where’s Locke at, physically and mentally, heading into this second series? DP: Locke is the kind of guy who even when he wins, he loses – and so while he and Spencer found Sophie Jenkins’ killer, it came at a steep cost. You don’t cause thousands of dollars in property damage and leave a warehouse full of dead mobsters without somebody saying something, y’know? And as a result, Locke’s under investigation from Internal Affairs, which puts his bid for custody of his young daughter Hero in serious jeopardy. But most importantly, Locke is a man without a mission – he’s confronted all the enemies from his past, and yet he’s found no peace. This is a man constantly at war with himself, but now his inner demons are getting worse than ever – and given that Spencer is just a manifestation of Locke’s subconscious, that means this once-cuddly blue panther is getting even more restless, pushing Locke to pursue his violent brand of crime-fighting even while on the bench. They’re really hanging on the brink, struggling to hold onto meaning in a cold and cruel world – which pits them directly against Roach Riley’s unique form of nihilism. JSJ: I think Locke as a character is interesting because he really is characterized by his weakness. Spencer exists because Locke couldn’t protect himself as a child, and now that he’s seemingly in the clear, Spencer and Locke both are sort of in a void of purpose. If Locke has reconciled all of these past ghosts and demons, why does Spencer exist? I think we’ll be going into that with this story and I hope people enjoy the psychological ride we have planned! BCP: It feels like the first series actually had a fairly concise redemption arc for Locke. Was a second series always something the pair of you had in mind, or was it born out of how well received the first series ended up being? DP: Having started my career as a newspaper reporter, I tend to write things modularly – I lean towards self-contained stories, but always try to give myself extra options in case I want to expand later. So in the case of Spencer and Locke’s emotional arc as they struggle to stop Roach Riley, that’s always been part of the plan – in fact, that’s been in my back pocket even before I reached out to Jorge! So thanks to the overwhelming response we got for our first arc, it really felt like a no-brainer to pursue Volume 2. Plus, it gave me the chance to keep working with Jorge, Jasen, Colin, Maan and Joe, who really are just a dream team to collaborate with. And I think the critical response really inspired everyone to up their game – honestly, I think SPENCER & LOCKE 2 is an improvement on the first arc on almost every level. JSJ: I wasn’t really planning on a sequel while I was working on volume one, just because I think it was important to round out everything that happened in those first four issues. 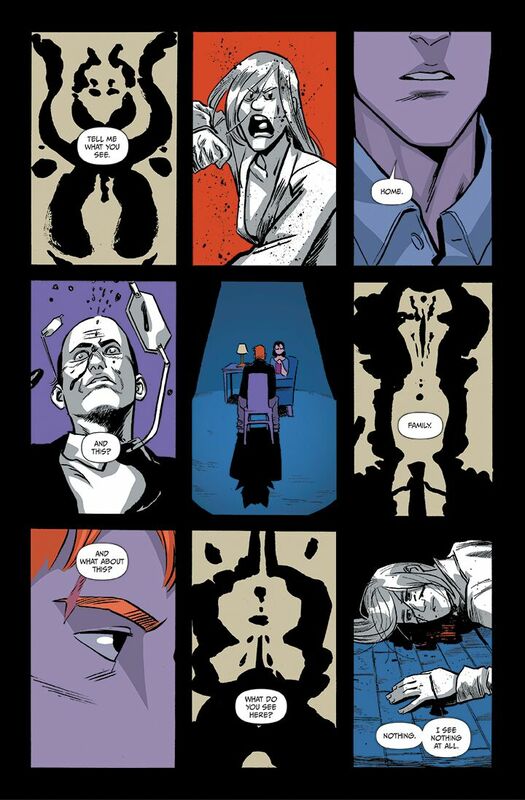 With SPENCER & LOCKE 2, we got a chance to explore the deeper psychologies of the established characters, which is always the best part of doing a sequel! The chance to take these characters and put them in front of a mirror is a great joy and one I wasn’t sure we would get to, but I’m glad the response allowed us to pick up these characters again. BCP: Without giving too much away, tell us a little bit about new threat Roach Riley? DP: If Spencer and Locke’s dynamic stems from a childhood filled with abuse, Roach has endured just as much horror and suffering… but on a much more accelerated time frame. Roach is the sole survivor of his platoon, but that survival came at a harrowing cost – something we’ll be peeling the layers back in our flashbacks. But as a result, Roach has come back with some very twisted philosophies about pain and scars. You might even say he’s gotten religion – and he’s devoted to spreading the violent gospel across the city. He’s bigger, faster, stronger, and more heavily armed than Locke, but they’re also two of a kind in more ways than one. Think of the unstoppable force meeting the immovable object, and you’ve got Locke and Roach’s twisted dynamic. JSJ: I think that Roach allows us to extend our books reach from crime noir to a war comic. I feel like noir and war stories are almost cousins in a way, so having Roach be the avatar of the horrors of war and Locke as the avatar of the ravages of crime, we get a chance to pit them against each other and see what happens. I’m a big fan of psychology, so this arc was a lot of fun to create imagery and symbolism for. BCP: How did the pair of you go about putting him together, both visually and in terms of his character? It feels like there’s a lot of influences coming into play here. DP: I like to describe Roach as Heath Ledger’s Joker, if he had also survived the events of The Deer Hunter. (Laughs) There’s also a little bit of Travis Bickle from Taxi Driver in there, a little bit of old-school Bullseye, and a little bit of Jason Bourne – just in the sense that he can effortlessly take Spencer and Locke apart. Ultimately, though, the Joker was of course the biggest inspiration for me for Roach, just getting into that nihilistic headspace and finding actual meaning and philosophy to build the rest of the character upon. JSJ: Visually I wanted Roach to feel inhuman, or at least, unreachable. He’s a person who has suffered, so he doles out pain to others, so he’s practically a monster, so in his design I wanted his movements, his posture, his smile even to have this wickedness to it so that even if he’s just sitting in a room, you feel he’s a threat. In terms of physicality, I see him having a voice and body like Matthew McConaughey but having the presence and intimidation of Javier Bardem in No Country for Old Men. I hope that comes through in the art! BCP: What kind of tone should readers be expecting from this second series? Are we looking at more of the same, or are you planning on changing anything up to accommodate this new threat? DP: Definitely – the most important thing for us when we decided to continue SPENCER & LOCKE was to keep growing and changing in terms of what kind of story we wanted to tell. With so many other books on the stands, it’s evolve or die – so whereas the first SPENCER & LOCKE was a fairly intimate psychodrama, SPENCER & LOCKE 2 gets to go the larger-scale action route, with Locke’s mental state being played out across an entire city. It’s no coincidence that we have a soldier as our villain – at its heart, SPENCER & LOCKE 2 is a comic about war, both in the real world and on the battleground of ideas. I’ll also add that not only is the scale of our story larger, but so is our cast – in addition to Roach, we’re going to see other members of Locke’s supporting cast, like his young daughter Hero, or Locke’s new love interest Melinda Mercury, who is our take on Dale Messick’s Brenda Starr. And like I said before, we’re taking our story across the funny pages, so count on seeing our unique take on strips like Hagar the Horrible, Marmaduke, The Family Circus… oh, and Sluggo is lit. Sluggo is definitely, definitely lit. JSJ: I think our first volume was us preparing this world so we can see what adding a rogue element like Roach to it will do. 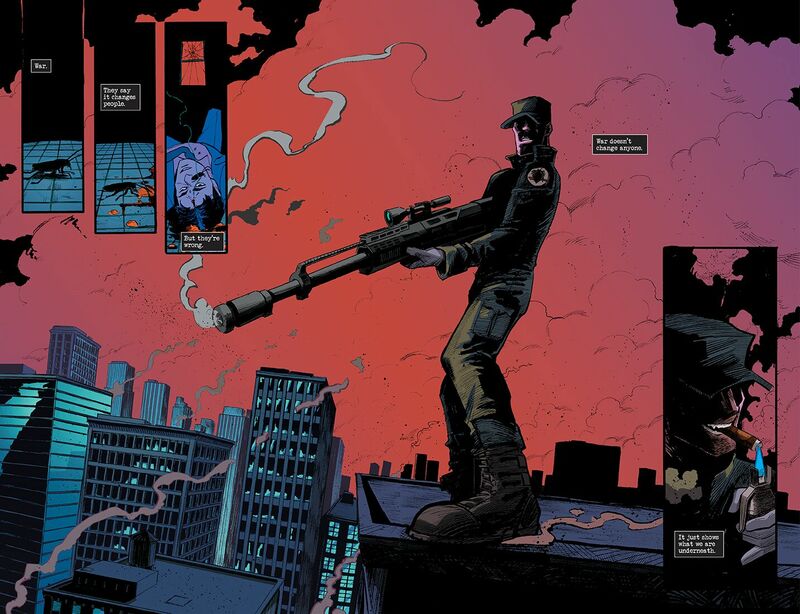 If Volume 1 was setting up the dominos of the SPENCER & LOCKE world, Roach is this massive stomp that sets the tiles dropping when they least expect it. It will be fun to see which are still standing when the tremor stops. BCP: How much input do the pair of you have on the fantastic colour choices of Jasen Smith, and what do you think he brings to the story? DP: I got my start in the industry as an editorial intern at DC Comics, and later studied coloring under Chris Sotomayor, and the thing they each drilled into me was the importance of color – that great color can elevate any type of artwork, but bad colors can sink even the strongest of lines. Thankfully, Jorge and Jasen really are a dream team, in the way that Jasen lights and renders Jorge’s work. Because I’m such a big believer in the importance of color in setting mood and tone, I work very closely with Jasen to make sure that each scene and each issue has its own identity and sense of purpose within the rest of the series – without giving too much away, we’ve done some really cool stuff with our third issue especially, using a new bag of tricks we haven’t utilized before. JSJ: I leave the color choices to Jasen, although if something comes to mind, I’ll usually put my thoughts out there, but I like to leave it up to him. BCP: And finally, what would you each say to someone on the fence about picking this one up to convince them to give it a try? But in all seriousness, fans of Bill Watterson’s Calvin and Hobbes will love the Easter eggs we punctuate our story with, but even people who don’t share our sense of nostalgia are realizing that the heart of our story is universal – this is the story of a man who has been profoundly hurt, but has found hope and perhaps redemption in the most unlikely of friendships. And I think that’s what has gotten people so invested in SPENCER & LOCKE as a series – because we’ve all been hurt at some point. The question is, are we destined to be defined by our scars… or can we get up one more time and do something good with them? JSJ: SPENCER & LOCKE is essentially Lethal Weapon but if Murtaugh was a walking panther man. We tried to make a book that could bring a smile to our reader’s faces and tears to their eyes, so if you do pick it up, I hope at least one those happened to you!